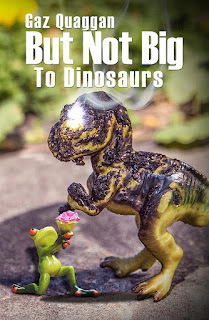 In light of forthcoming National Short Stories Week (14-20 November) Austin Macauley approached me to review one of their recent releases: But Not Big To Dinosaurs by Gaz Quaggan. First I'll share a bit of info on the release and then I'll finish with my review. 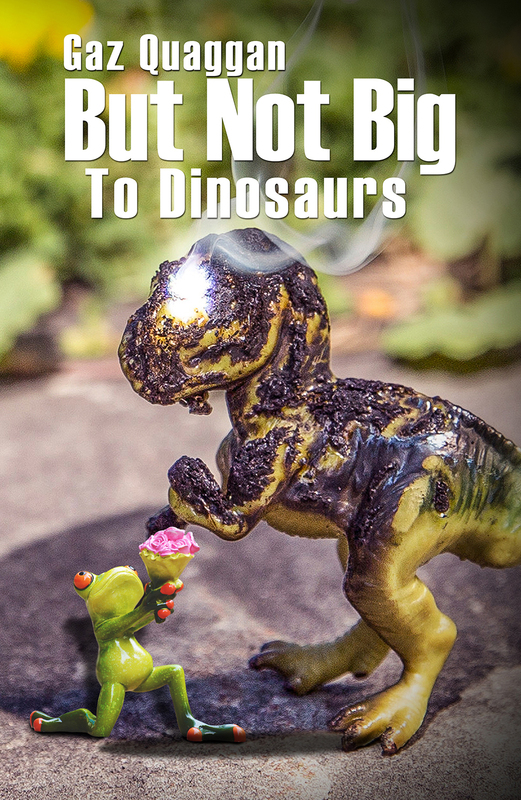 If you want a book with wordplay that you can dip into and groan or laugh with in equal measure, then Gaz Quaggan's But Not Big to Dinosaurs is the book for you. Quaggan writes with a blitzkrieg stream of consciousness, inventing, defining and exploding words as he covers topics as diverse as Reptilian Anchovies and Poltergeist Baguettes. At strategic points there are chapters containing pure gags which you can impress your friends with at the pub (or lose them). So if you have a slightly alternative view of the world and wish to confirm that you are not mad, then take your sounding from But Not Big to Dinosaurs and feel safe in the knowledge that you were right all along. A book of fun that will grab hold of your mind and run away with it. Born in the Isle of Man in the ‘60s (1960s and not 1860s) Gaz is a family man who loves spending time with his family and walking his dogs on the beautiful beaches around the island. He is also passionate about his football and never lets that dampen his light-hearted mood. I finished But Not Big To Dinosaurs yesterday and have spent the time since struggling over what to write in my review. In the publisher's original notes to me, they classed this book as "fiction", "humour", and "short stories". You will note I have not included the latter in my classification above, and that is because I find it misleading. There are no stories with plot and characters in this book; each chapter is simply like a blog post in which the author expounds on various topics. This was not what I'd expected from the way the publisher introduced me to the work. I had anticipated a collection of short stories - zany, but still recognisable stories with a beginning, middle, and end. Was it humorous? At times, yes. However, I am not easily offended. For those who are, this is probably a work to avoid since the author frequently jokes at the expense of women, other nationalities etc. An inability to spell words or use proper grammar also ties in with the humour, but to me these types of jokes fell flat as I found them more annoying than funny. Were I to have come across these blog posts as actual blog posts, I might have read a few, laughed, and contentedly moved on. For me, the difficulty comes in the fact that this work is in book format. As a book, would I buy it for myself or others? Probably not. I dislike giving bad write-ups, especially when it's a book I've received for free; however, the whole point of ARCs is to garner honest reviews, so I feel I must be honest. Overall, I'm giving this book 2.5 starts. It has funny moments, and if you share the author's sense of humour, you'll probably laugh aloud and enjoy it. That said, some readers may find the humour offensive, so I'd approach with caution if you take such things easily to heart.